Yippee, most of the rest of the bricks arrived (there are still a couple where we were short for various reasons, but that won't stop us). Next was filling in mostly the missing tiles on the body. Some of the white tiles for the panel outlines were missing, as well as tiles on the vents and some of the coin return slopes. Detail of the side vent, notice that the blue parts are recessed. The quarter of the body that fits together so far (3 other panels are done, but they're the same or mirrors of these and don't directly connect). Next, the legs. I really like the detail on the leg strut and it's angled square top. Also the complex curves where the notches are, and at the top of the booster cover under where the shoulder hub will go. We were missing the little slope parts and some tiles to make this all work. The center foot was also missing a couple square plates on one side, but the photo isn't really different than before, so I didn't include it. Also the side "footprints" were also missing square plates, but they're not very far along, so I'll photograph them when I do the rest. Next up is probably more of the body, probably starting with the rest of the back since the two remaining back panels would allow me to connect 8 of the 12 body panels. The parts we needed for the body arrived!!! We're still waiting on ~1500 of the original ordered parts (a little bit of rework has caused us to order a little more since then). So there're still some gaps for parts. Considering it's 15K+ parts, we've done great missing 10% of the bricks! Three are next to each other, so we can see how they fit. If you can get over the missing bricks, you can get an idea of the 3-D detail. I'll probably take some close ups when we get the other bricks filled in. And an idea of the scale, Lara posing with the partial body. Apparently throwing in all the Lego and Sci-Fi stuff scared away all our subscribers (yes, both of them) that just wanted cat and disaster videos. Since a half million views are of the storm and only 150 for L3-G0, it seemed prudent to separate them. (Feel free to get L3-G0 up to that level, I won't mind). Well, something about having to work, so I didn't get daily updates. Instead the bits are interrupted and built over a few days. We still don't have all of the parts, so there's a few holes to fill in the results, but there's a good start on the skirt (under the body), the very top of the dome (I thought I had all the parts, but it's missing a little gray ring), and the legs. I thought I had all of the parts for the tippy top of the dome (above the pie plates), so I figured I'd whip that out in about 10 seconds. Unfortunately I'm still waiting for a little ring on the very top. (Hopefully tomorrow). I was able to use the flying saucer or whatever they're called parts for this part of the dome. The angles and sizes matched surprisingly well for that. More successfully I worked on the legs. Again, some parts are missing, but I got further, including some complicated stuff. Obviously they're incomplete, but I'm reasonably happy with the detail. One thing I realized looking at a photo of a real R2 is that my legs seem a bit tall. I was expecting them to attach to the plate on top of the ankle, but the distance between the notch and the bottom seems longer than on the real photo. Coincidentally, the R2 builders group had a thread today that mentioned "standard" and "extended" legs. I wonder if I followed plans for "extended"? Clearly there's some measuring in my future to make sure I get them the right height. Day 2 building L3-G0. Mostly finished the center foot, except a few parts are missing (still on order), which is part of why the corner edges don't fit as nice as they eventually will. Also the center ankle cylinders (back one's also missing some parts). 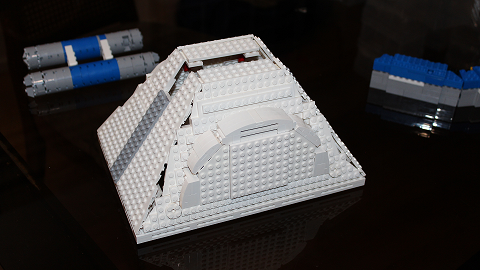 And a tiny bit of the dome, which was missing a lot of parts so I decided to come back to that later. The dome edge will need a little rework, and it's got me wondering a bit about how I'm going to fit it to my bearing. Not all of the parts are in yet, but there's some stuff I can start on, so here's the results of day one constructing L3-G0. First I worked on the Holoprojectors (they go on his dome) because I thought I had all the parts. Turns out I'm short the curved pieces on the bottom, so the white will need replaced with gray when it arrives. The funny colored plates are just to hold the HP together until it gets on the dome. Also notice how the top right holoprojector is pivoted? That caused a bit of extra work, it would've been easy to make them stick straight out, but the real ones were made from those vent things on an airplane that point in different directions, so I wanted to keep the ability to move them. That caused some extra work. In addition to the holoprojectors, I started on the feet. For the main feet I did what I'm calling the "footprint", before it starts angling. For the front center foot I got most of the front and back, and some of the sides done. We've got brick!!!!!!!!!!! The mailman's a bit impressed. This is JUST ONE DAY's delivery, only 18 packages of 52. And when you get bricks, you have to sort :( Thanks Jaron for the sorting boxes! As of today we have enough to start building, but we're still waiting on 6 packages, so available parts will guide what we start building with. Wow, ordering parts is hard. 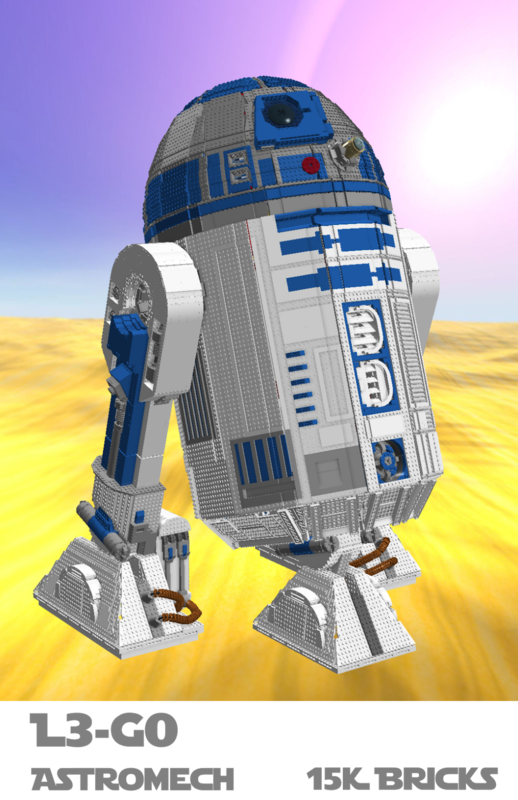 L3-G0 needs about 15,005 parts. It took two days stumbling around bricklink to order approximately 13 thousand parts (we had a few thousand lying around home). We ended up placing 52 orders (one with Lego themselves). We're still short a few bricks, click to see the list. I wanted this to be all about L3-G0, however it occurs to me that its not easy to find out about our other MOCs, so here are some links. * http://www.youtube.com/shawnlara - Disorganized YouTube channel with MOCs (don't tell google that you clicked on the ads for me). Thanks to the Bricklink sellers I got parts from, ordering ten thousand parts is tough! Special thanks for these sellers for helping with discounts. My costs are still unmanageable, but every bit helps! (There's a list of tough bricks still if you want to help). Thanks to Jaron Kelley from SEALUG or providing sorting boxes!!! Thanks to everyone I got parts and other help from. The following Bricklink sellers helped, ordering ten thousand parts is tough! Special thanks for these sellers for helping with discounts. My costs are still unmanageable, but every bit helps! We've made a few Lego models, such as the Lego Disney Wonder cruise ship and a Lego Space Needle, and it's about time to do something new, but all of our ideas were pretty lame. So in the back of our minds there was some thinking about "what could we build next?" Then we went to Emerald City Comicon and saw some of the wonderful Astromechs there. Of course I wanted to build one, but quickly realized it'd be a ton of effort, cost a lot, and I wasn't terribly familiar with the materials. 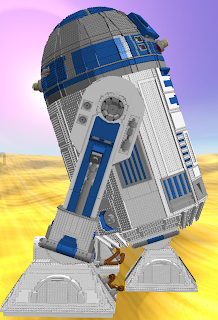 It should've been obvious, but "gee, I wanna build a droid" sat in one part of my brain while "I wonder what I'll build next in Lego" sat in another part. Eventually we came to the obvious conclusion: "I'll build an L3-G0". Don't know why it took so long. Normally I grab a bunch of bricks and start building, then get more bricks, but for various reasons I started toying around with some of the sections in Lego Digital Designer to see if some of my ideas were practical. Of course, once I started, I forgot to stop. There are some parts that will undoubtedly need changed from the LDD model, and he's going to need an internal frame of aluminum or wood or something, but it should be do-able. 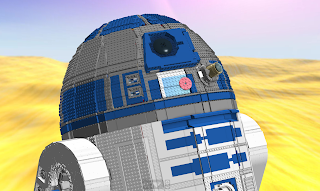 The model is based on plans from the R2-D2 Builder's Club (Astromech.net) Of course brick isn't as finely detailed as manufactured parts, but he should be "pretty close" to spec. He'll probably be about 100 pounds. Eventually we'd like more functionality, but for a start we're looking at getting him to move and beep in time for Emerald City Comicon (ECCC) 2014. We'd love to take him other places too, anyone know how to get him to Celebration in one piece? We'll post more as the project goes. Bricks acquired so far: 15900/16000.